Posted on June 12, 2015 at 3:55 pm. This is one for all the registered users at Royal Vegas Casino, as this awesome promo is available to pre-existing customers only. For the next three days starting Friday 12th of June and expiring Sunday 14th June, Royal Vegas will give you $100 free for every $100 deposit you make. Check your inbox for the promo email from Royal Vegas titled ‘deposit now – get another 100% free’ and click the email link to login. Select your payment method and make your deposit of $100 or more. You’ll instantly receive $100 for free credited to your account. You can scoop up this offer more than once, so making multiple deposits of $100 will result in an even bigger boost to your Royal Vegas bankroll. But hurry, you have three days only, so you better get cracking! With heaps of new game additions, that extra bonus will be hugely appreciated, giving you the chance to enjoy the full real money experience playing new pokies like Ariana, Big Chef, Pistoleras, Kitty Cabana, Hound Hostel and the Legend of Olympus. Playing for real money at Royal Vegas will also give you the chance to earn tickets towards the huge Fortune Lounge Group cruise, which is still running up until the 31st of July. New users (both desktop and mobile) receive a huge $1,200 welcome bonus, which can be used on over 500 of RVC’s leading online casino games. 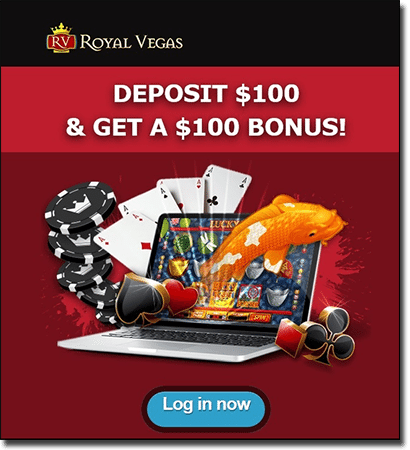 If you’re not a registered player at Royal Vegas but want to be part of awesome promotions like this and many others, head over to www.RoyalVegasCasino.com today and sign up for your own account.